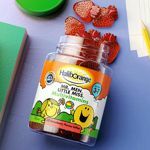 Claim a free sample of Haliborange Multivitamin Softies for kids 3+ years. To claim simply go to the Haliborange Facebook page and click to sign up on the sponsored post (currently at the top of their Facebook page – 21st January 2019). The Haliborange Multivamin Softies come in Orange or Strawberry flavour and contain 7 essential vitamins including vitamins A, C, D & B12.